Endress+Hauser has completed its portfolio of radar instruments with Micropilot FMR60, FMR62 and FMR67. The new Micropilot series provides the company’s first instruments with 80 GHz technology, which has been developed according to the safety-by-design concept of IEC 61508. Furthermore, they belong to the first generation of level instruments that, like many flow instruments from Endress+Hauser, support Heartbeat Technology. Endress+Hauser presented its new level campaign during 2017, but adds tongue in cheek that nobody can actually do anything with 113 GHz. All they did was add the frequencies of the existing instruments to demonstrate the overall company competence in the radar range. The new level campaign is therefore called ‘113 GHz + Your Wavelength’. 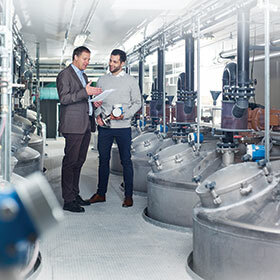 Endress+Hauser is not concerned with faster, higher, further. At present, everybody is talking about the highest radar frequencies in the industry. But the real issue is finding the best fitting frequency for each application. In order to accomplish that, staff must listen very carefully to the requirements of customers so that they can give good advice. The aim is to find the right wavelength based on a common understanding. In the area of tank gauging, Endress+Hauser has launched Micropilot NMR81, the first highly accurate instrument with 80 GHz technology for the oil and gas industry. Now, the company is adding Micropilot FMR6x to serve other industries. Accuracy is at stake, but safety and the provision of simpler processes for customers are equally important. For the first time, an 80 GHz process radar is available which pursues the safety-to-design concept, thus making the life of customers much easier in terms of safety. In addition, the product offers a wide selection of Ex approvals. Improved focusing of the radar signal as well as dynamic algorithms provide reliable, stable measurements with a measuring range of up to 125 metres and an increased measuring accuracy. The measurement is unaffected by baffles or obstacles at the tank walls. Due to the innovative antenna design, build-up and condensate do not impair the measuring result. The interactive commissioning software makes this task fast and easy. and included documentation also saves time and costs. An automatically generated test protocol supports the evidence concerning regulations, laws and standards. The monitoring area of Heartbeat Technology provides instrument and process data, thus facilitating trend recognition for predictive maintenance. The aim is always the optimisation of processes in a targeted manner. Therefore, a combination of instrument and process parameters provides all important details for a respective analysis.